The quadratic cost optimal control problem for systems described by linear ordinary differential equations occupies a central role in the study of control systems both from the theoretical and design points of view. The study of this problem over an infinite time horizon shows the beautiful interplay between optimality and the qualitative properties of systems such as controllability, observability and stability. This theory is far more difficult for infinite-dimensional systems such as systems with time delay and distributed parameter systems. In the first place, the difficulty stems from the essential unboundedness of the system operator. Secondly, when control and observation are exercised through the boundary of the domain, the operator representing the sensor and actuator are also often unbounded. The present book, in two volumes, is in some sense a self-contained account of this theory of quadratic cost optimal control for a large class of infinite-dimensional systems. Volume I deals with the theory of time evolution of controlled infinite-dimensional systems. It contains a reasonably complete account of the necessary semigroup theory and the theory of delay-differential and partial differential equations. Volume II deals with the optimal control of such systems when performance is measured via a quadratic cost. It covers recent work on the boundary control of hyperbolic systems and exact controllability. Some of the material covered here appears for the first time in book form. 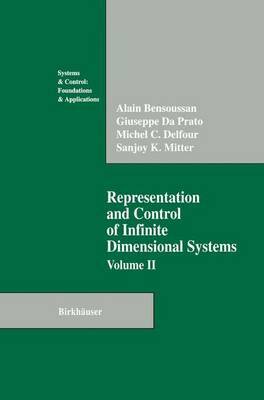 The book should be useful for mathematicians and theoretical engineers interested in the field of control.